"A well-balanced weapon with a powerful thrust and a short recovery time from card breaks." Defeat Captain Barbossa in Port Royal. Follow the Wind is a Keychain for Sora's Keyblade which appears in Kingdom Hearts Re:Chain of Memories and Kingdom Hearts II. 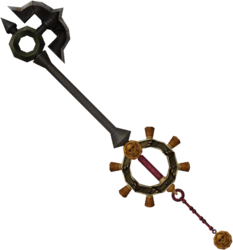 The Follow the Wind is also one of the types of Keyblades left at the Keyblade Graveyard. In Kingdom Hearts II, Sora obtains this Keychain after defeating Captain Barbossa in Port Royal. 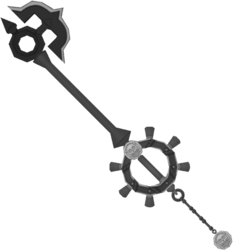 The teeth of the Keyblade are shaped like a ship's anchor. The guard resembles the ship's helm. 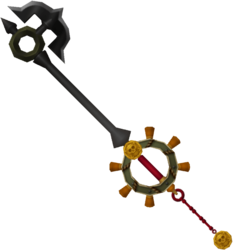 There is one of the cursed Aztec Medallions on the Keyblade's hilt and another as the Keychain token. 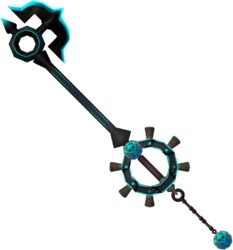 The Keyblade produces Medallion emblems when it hits an object. The variety seen at the Keyblade Graveyard has a darker, greyscale color scheme and a thinner anchor at the teeth. It also lacks a Keychain. Because the ability for Follow the Wind is Draw, this makes it very helpful for leveling up Master Form, especially if it is combined with one or more additional Draws and/or the Wishing Lamp Keyblade (which has Jackpot). Follow the Wind is the Keyblade wielded in the Series 1 Play Arts Figures Wisdom Form figure. The variation of the Follow the Wind that appears in the Keyblade Graveyard. This page was last edited on 19 April 2019, at 12:39.